Since the invention of the non invasive brain scan, neuroscience has been pivoting away from being a social science towards physical science. Often times neuroscience studies oversimplify the complexity of the brain and assign explanations that were actually false. For example there have been studies linking activity in the insular cortex to feelings of love although the insular cortex is also responsible for other feelings such as disgust, the complete opposite, and shows activity after one third of all stimuli. In recent years non invasive scanning and artificial intelligence of the brain has transformed the study of neuroscience into a physical science. A social science can be defined as the scientific study of human society and social relationship. In its earlier days the study of the brain was a social science with people such as Sigmund Freud studying the unconscious and how it relates to human behavior. On the other hand a physical science can be defined as a science concerned with the study of inanimate natural objects, including physics, chemistry, astronomy and related subjects. In recent application, artificial intelligence programs have been used in analyzing consumer personalities on inanimate platforms such as Twitter and Netflix. Additionally artificial intelligence is being advanced by using algorithms based on human cognitive states. Advancements in brain scanning are showing how certain stimuli affect a person's brain and what the best way to scan the brain is. Developing the best scanner for the brain requires extensive scientific research and engineering and is vital in the understanding of artificial intelligence. Artificial intelligence algorithms are being developed to distinguish among a variety of cognitive states in humans. These algorithms observe fMRI data to base their analysis and for example by evaluating the results of brain scans the software can determine whether the subject is reading a sentence or viewing a book. Dr. Andrew Ng, a Stanford professor, researches machine learning and has built very large cortical simulations. Dr. Ng is leading the way in developing more independent algorithms with his knowledge of deep learning. Deep learning technologies make software capable of learning from observing activities instead of having to be programmed. Usually when attempting to use artificial intelligence programs it is very time consuming to input all of the variables involved; almost so time consuming you would be better off without the algorithm. The Deep learning technology completely cuts out inputs making the process much more efficient and less time consuming. Dr. Ng's study establishes the science of getting computers to learn without being explicitly programmed. A good example would be Google, every time you search on a Google web browser it learns a little bit more on which results should show up when specific searches are made. One more advanced project that Dr. Ng is working on is getting robots to do house hold chores. The robots are capable of learning from observing individuals and repeating their actions. Dr. Ng is leading the way in artificial intelligence and recently partnered with Google to create the Google brain which is a robotic duplication of a human brain. It has been 60 years since the invention of artificial intelligence when Allen Turing, from the United Kingdom, created the Turing test for artificial intelligence. His test states that if a machine cannot be distinguished from a human then that machine is thinking. The test requires that 30 percent of human interrogators are tricked during a keyboard conversation into thinking a robot is actually a human during the conversation. On June 8th in 2014 a supercomputer named Eugene passed this test which was a groundbreaking development. For the first time in its 60 year existence due to developments in artificial intelligence and deep learning one third of human interrogators were convinced a computer was a human. More importantly for the first time a machine was thinking. Artificial intelligence has more applications than just human imitating software. Google has a secret lab in Silicon Valley where the future is being envisioned currently and much of it requires usage of artificial intelligence. Technologies that would connect your refrigerator to the internet to order food or have your dinner plate post to social media what you are eating are being developed in this lab right now. Another ground breaking invention being worked on is the driverless car. Google unleashed this invention onto the roads of California in 2013 and there has been talk of translating this technology into a new business for them. Furthermore artificial intelligence is being used in Google's android operating system to assist in voice recognition and robots are being developed to replace the jobs of many humans, for example those who take pictures of the streets for Google maps. Google will go as far to argue that every time someone uses the internet they benefit and that is why they are trying to connect more things to the internet using artificial intelligence. Light bulbs that could be turned off remotely, a coffee pot that can brew remotely and a garden planter being watered remotely are just a few examples of what Google has up its sleeve. Dr. Ng is at the heart of many of these developments as he tries to develop robots that learn like humans. At the heart of these deep learning and artificial intelligence technologies are artificial neural networks. An artificial neural network is an information processing paradigm that is inspired by biological nervous systems, such as the brain. An information processing system is the key component to the network. Highly interconnected processing elements referred to as neurones work to solve specific problems. Neurones are modeled after the neurons that are located in the human brain and help to achieve characteristics of the brain such as adaptive learning. Additionally they have self organization capabilities meaning that they can create a representation of information that is received when learning. These networks are capable of still processing after major network damage. As compared to conventional computers they take a different approach to problem solving. Computers follow instructions and use an algorithm to calculate data. Unless the computer is aware of the specific steps it needs to follow then the task cannot be completed. On the other hand these networks do not require the use of instructions they in theory create their own instruction making them essential for deep learning. The creation of artificial neural networks rely heavily on our understanding of the neural networks that exist in humans, by using non invasive brain imaging we can learn more than ever about them. The human brain has an extensive network of neural connections and produces countless amounts of behaviors which provide significant tasks for researchers when trying to understand it. In recent decades groundbreaking advancements have been made, such as, the positron emission tomography, magnetoencephalography and functional magnetic resonance imaging. All of these techniques are noninvasive and have provided platforms for huge advancements in the understanding of the brain. In coming years the understanding of oxygenation within the brain will be vital in understanding its processes. The Near-infrared spectroscopy was the first technique to measure oxygenation in the brain and has provided many answers for neuroscientists. In 1977 a noninvasive brain scanning technique was created by F.F Jobsis. The technique he created is referred to as near-infrared spectroscopy (NIRS) which is a point source measurement of absorption changes inside a tissue. Jobsis began by studying cats whose heads were about 4.5 centimeters in diameter; the head of a premature baby is about 5 or 6 centimeters. Jobsis believed that with a little bit of innovation he could test his technique on premature babies and with the help of his colleagues at the University college of London they did just that in 1984. Throughout the 80s and 90s this technique was used extensively in the study of measuring cerebral hemoglobin oxygen saturation. Evolving from this initial technique, imaging with diffuse light was created. Once figuring out this diffuse method, researchers needed to figure out a better understanding of how light will disseminate through tissue. After much research light propagation is achievable. The fMRI is one of the more recently developed brain scans. In the 1990's it was created. The invention is generally credited to Sejii Ogawa and Ken Kwong. The fMRI is one of the latest in a long line of innovations beginning with the near infrared spectroscopy and positron emission tomography, which use blood flow and oxygen content to picture brain activity. There are several advantages to the technique, it is non invasive, does not emit any radiation making it safe and has excellent resolution making it rather simple for the experimenter to use. To get the best MRI you must be able to measure increases in Oxygen increases in the brain as illustrated below. By using fMRI technology researchers have learned about many different areas of the brain including memories, language, pain, learning and emotion. Recent advancements to the Diffuse Optical tomography scan prove to replace the fMRI as the best brain scanner. Diffuse Optical Tomography is a groundbreaking technology that helps to localize and measure changes in neural activity during a variety of tasks. When performing a DOT scan the test subject puts on a helmet that is linked to computer screening which displays brain activity. By evaluating cerebral blood flow and changes in concentrations of oxyhemoglobin and deoxyhemoglobin neuronal activity is detected. Large increases in local arterial blood flow and volume are triggered by neural activity and do not result in a similar increase in the utilization of oxygen. As a result concentrations of oxygenated hemoglobin will increase which causes a decrease in deoxygenated hemoglobin. Collectively these changes in brain activity are referred to as the BOLD effect. In the 1970's a technique referred to as Pulse Oximetry was developed to measure changes in the oxy to deoxy hemoglobin ratio in capillaries an veins that exist in the brain. Unfortunately these measurements are much more complicated than originally perceived. DOT is the technique that is replacing pulse oximetry by illuminating brain tissue and measuring the complex patterns of light more accurately. DOT emerged in the early 1990s and allowed researchers to divide the region of interest to make more precise measurements. In the past DOT was limited to small areas of the brain but now according to Washington University researchers in St. Louis two thirds of the brain can be scanned by using a new version. Below the portability of the DOT scan is displayed as opposed to the fMRI scan. In the future it is a believed that NIRS, fMRI and DOT scanning may contribute in diagnosing and treating psychiatric ailments such as depression, schizophrenia and Alzheimer's disease, as well as stroke rehabilitation. In 1996 a study was performed that found that those with depression exhibited either a non dominant hemisphere response pattern or a bilateral response pattern during a mirror drawing task. Additionally other tests are being developed that can measure activity in the brain using brain scanning techniques. A similar drawing test was performed on schizophrenic patients which found that these individuals did not show the typical pattern of right lateralized activation during a continuous performance test. Noninvasive scanning is putting an explanation to many unexplained ailments that involve the human brain. In addition to psychiatric ailments non invasive scanning has been extremely important in the treatment of Parkinson's disease, specifically with deep brain stimulation. By making use of non invasive brain scanning techniques it can be evaluated whether a patient is eligible for deep brain stimulation. 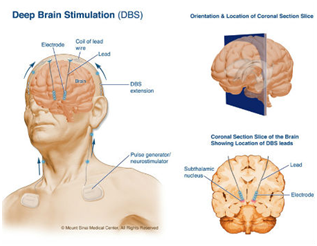 Deep brain stimulation involves electrical leads being used to stimulate brain tissue in the treatment of diseases such as Parkinson's disease tremor and essential tremor. A typical brain stimulation system comprises a pulse generator operatively connected to the brain by a lead. The lead contains one or more stimulating electrodes at its distal end and is designed to be implanted into a patient's brain so that the system of electrodes is properly positioned for the desired stimulation. A patent was awarded to Medtronic Inc for a lead anchoring system that discloses a method of positioning the lead so the electrodes are located at a desired site. By using a stereotactic instrument precise movements are permitted within the brain. This invention combines both macro and micro electrodes for the stimulation of the brain. Below deep brain stimulation is illustrated. The University of Florida is a leading medical center for deep brain stimulation surgery. This procedure entails placing a stimulator into one of many different targets including the thalamus, subthalamic nucleus, globus pallidus, internal capsule, nucleus accumbens, and other regions. By utilizing advanced brain imaging, stereotactic targeting, microelectrode recording and macrostimulation the devices can be placed in an operating room setting. The University of Florida center has a fellowship of trained movement disorder neurologist and neurosurgeons who are dedicated in providing medical optimization. A study done on May 19th, 2014 improved an optical brain scanner that can help find brain activity that no other scanner can. As discussed earlier these researchers expanded the DOT non invasive technique to be able to scan 2/3 of the brain, more specifically to image brain processes that take place in multiple regions and brain networks involving language processing and self reflection(day dreaming). This new optical approach to brain scanning is meant to be used on children and for patients who have electronic implants such as cochlear implants, deep brain stimulators (used for Parkinson's disease treatment) and pacemakers. Joseph Culver an associate professor said "We've achieved a level of detail that, going forward, that could make optical neuroimaging much more useful in research and the clinic." The accuracy of the DOT scan is remarkably close to the fMRI, especially on resting subjects, yet the scan is highly portable unlike the fMRI. The main advantage of this DOT technology is that it can scan parts of the brain that MRI's and other scanning technologies cannot. Additionally while MRI scanning fails to eliminate exposure to radiation the DOT scanning does not. The creation of DOT scanning involves the engineering of a complex portable brain scan contributing to physical science. As of today the DOT scan is the best brain scanning technique out there. Researchers from the University of Minnesota biomedical engineers and researchers who are affiliated with the Mayo Clinic published a groundbreaking study in 2012. The study states that non invasive scanning immediately after a seizure can give additional insight into possible causes and treatments that are available for epilepsy patients. This is the first study that focused on the time right after the seizure instead of during it. Researchers found that seizures occur most frequently in the temporal lobe for adults. The new brain scanning technique established and helped to determine the side of the brain where the seizures occurred. Additionally the frontal lobe typically has the most severe seizures. Epilepsy is a disease that affects nearly 3 million Americans and 50 million people worldwide and these studies have provided insight into possible treatments and explanations for seizures. Researchers at the University of North Carolina, Chapel Hill, made the discovery that micro RNA can be used to make brain cells resistant to programmed death which is referred to as apoptosis. Through normal growth and development human brain neurons will die as a natural part of our lives. A portion of neurons will not die and will stay for the long run and scientists have linked these neurons long lives to microRNA. MicroRNA can be measured by using noninvasive techniques more efficiently than ever before. This discovery can lead to the controlling of neurological diseases such as alzheimers, ALS and Parkinson's. 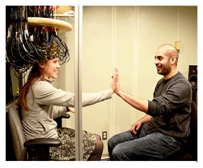 A recent NYU study set out to study stereotypes and how they relate to brain activity. Those with less stereotypical minds showed more electrical activity when scanned in the part of their brain associated with self control. What this study suggests is that the brain is capable of a conscious override of bias. The national institutes of health began a $4.5 billion dollar project to map the human brain. The project will take place over 12 years and originally was announced by Barack Obama in 2013 as a project to measure the fluctuating patterns of chemical and electrical energy that flow through the brain and its circuits. The initial focus is going to be developing new tools to measure crucial activities in the brain for the first five years. After establishing new techniques they would then be used to make more fundamental discoveries on how memories are made and retrieved. The point of the project is to understand the circuitry within the brain. This project is the single largest brain-map study ever and is sure to help uncover many hidden truths about the human brain. Recent research has concluded that people with access to their brain scans have significantly improved their brain regulation to successfully perform tasks. As a result of better brain scanning and understanding of neuroscience this has become possible. Additionally, researchers in Taiwan have found that applying a weak electrical current over the front of individuals scalps for just ten minutes significantly improve their ability to control their behavior. It is believed that the current jump starts impulse control in a part of the prefrontal cortex referred to as the pre supplementary motor area. While brain stimulation has existed for quite some time, non invasive stimulation of behavior is on the cutting edge of science and could be the beginning of new therapies to treat impulse disorders such as ADHD. While the manipulation of memories has long been an area of study by science in recent years that study has become practice. Israeli scientists have displayed how to erase memories such as those linked to drug addiction and traumatic memories. An injury to the right temporoparietal junction of the brain which is located behind the right ear typically leads to changes in moral judgments. Recently research has come out that magnetism can lead to the same effects in just a matter of minutes. All of these ground shattering studies would not have occurred with the technologies that we have today. Throughout the history of brain scanning, designers have improved capabilities allowing for them to measure an increased area of interest and improve the systems capabilities. Additionally through time the components have become smaller as technology has developed. Today NIRS consists of a small probe with fiber optic sources, detectors and a piece of hardware which will typically fit in a brief case. Advancements made in the past 10 to 15 years have made scientists capable of measuring the adult brain which never before was believed to be possible. By making use of non invasive techniques some remarkable discoveries have been made in all aspects of science both social and physical. A main question among philosophers is whether or not humans have the ability of free will. In 2007 the answer to this question was found by John-Dylan Hayne's at the Bernstein Center for computational Neuroscience in Berlin. A test was performed by putting people into a brain scanner that displayed a succession of random letter. The subjects were told to press a button with either their right or left index finger whenever they felt the urge and to remember the letter that was being shown when they made the decision. 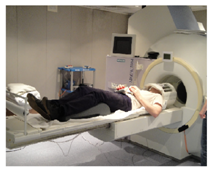 In the experiment a functional magnetic resonance imaging system (fMRI) was used to reveal brain activity. The results showed that a conscious decision to push the button was made about a second before the actual act, but the team discovered that a pattern of brain activity seemed to predict that decision by as many as seven seconds. These results are astounding because it shows that before the subjects were aware of making a choice the decision had already been made. This study shows evidence that free will may not be something that humans are capable of. With the advent of Diffuse Optical Tomography more areas of the brain can be examined and more knowledge regarding free will can be attained. With the advancement of the DOT scanner, scientists have created the best brain scanner yet. The scanner is portable, efficient and non invasive. In decades to come there will much to learn from DOT scanning. Using DOT scanning researchers we will be able to learn more about neural networks and apply that to artificial intelligence. Charles R Goulding Attorney/CPA, is the President of R&D Tax Savers. Charles G Goulding is the Manager of R&D Tax Savers. Matthew Saltzman is a Tax Analyst with R&D Tax Savers.